Our costume is a family costume. Worn by Mom, Dad and two sons ages 3 & 9. These costumes are mostly handmade by myself, the mother. The idea developed because I lovingly refer to my youngest as our "sour patch kid" because he's either very sweet or very sour. 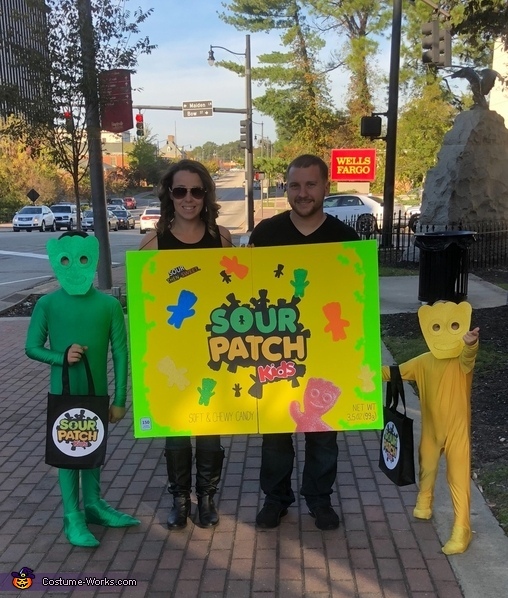 I decided to make it into a family costume by having myself and my husband be the "sour patch box" and my sons be the " sour patch kids". 1 computer printed paper with a large red sour patch kid on it. Directions. Used the poster board letters to create the logo. Used the black poster paper behind and poster board letters. Cut out a few glitter sour patch figures to add around board. Printed out a "Sweet then Sour" text off the computer. Hand drew the packaging weight and grams as box stated. Used glue stick and hot glue to secure materials. For sides I cut the thick lime green board in half and drew tabs on the both sides. I used the thin lime green paper to trim the front and blend with the sides of the box. Used hot glue to attach the sides to front of box. We wore the box by using a simple string around our necks, held on by extra sticker glitter paper and hot glue. Total cost about $25each kid. I also printed out the original sour patch th logo onto carstock paper and hot glued hat onto a $1 store tote bag for candy bags.